I went to back to @Ulah_Bistro with my girl @CristaArias to use up the @Groupondc that I had for there. I have been there once before, again with Crista, and food was AWESOME so we planned to go back and when I saw the Groupon for it, I knew it was a sign. When I arrived, I looked for Crista upstairs and ran into a speed dating session event that was just starting. I immediately returned downstairs and to my relief, Crista had arrived. Since we hadn’t hung out in a while, it took us a while to decide since we had to stop talking first lol. We both really enjoyed our dishes from our first visit but wanted to try something new. The first time we were there, I had the Braised Boneless Beef Short Ribs with Gorgonzola polenta, sautéed broccoli, and a root vegetable sauce and Crista had the Braised Lamb Fettuccini made with tender lamb shank, glazed root vegetables, and shaved parmesan. When it arrived, the lamb shank was so beautifully big, we barely notice the fettuccini underneath at first. It was delicious and tender and lasted her for a couple meals and ended with a treat for her dog. As delicious as her pasta was, my short ribs were even more delicious!!! They were fall off the bone tender and so amazing that it was hard to fight the temptation to not order them again this visit. We started off with the Fried Calamari which is lightly battered and served with Marinara Sauce. It was a little too lightly battered, the batter kept falling off in the sauce, but they were fresh and otherwise well prepared. We ate and chatted while deciding what else to order and that is when I bit into a piece of plastic. Now I’ve worked in restaurants on and off since I was about 15 yo so I know that stuff can happen and it wasn’t anything gross or weird so we were not freaked out. Also to me, how someone handles a mistake says a whole lot more to me then if they make it in the first place. I called over our waiter and showed him the plastic and explained and the manager was sent over. She offered to replace the calamari but we had already eaten half prior to the discovery and did not really want more and thanked her and I stated that we had just wanted them to know. 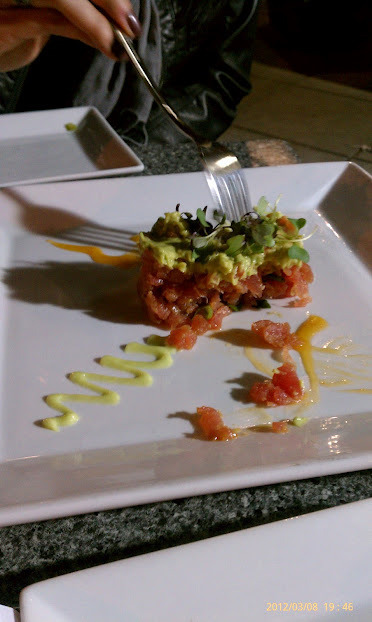 She insisted on bringing us something else and suggested the Ahi Tuna Tartare which is Tuna Loin, Avocado, Orange-Sesame Dressing, and Wasabi Aioli. OMG was it AMAZING!! We weren’t even really upset but had we been, we would have immediately forgotten why we were. That made everything right and both us probably could have just had a bowl of it for dinner. It was fresh, soft and DELICIOUS!!! Definitely a must try. Another must try is the Ulah Peartini which is Grey Goose Pear, Simple Syrup, Apple Juice, and a Splash of Sour. Both of us got one and it was also excellent. I tried the Ulah Tea for round two – Stoli Blueberry, Stoli O, Stoli Raspberry, Cranberry Juice, Sour, and Soda. It was also good but not as much my kind of drink. Crista had the Sage Cream Orecchiette with ham, tomatoes, mushroom, peas, and a sage cream sauce while I had the “4” Pizza is topped with Pork Belly, Caramelized Onions, Gorgonzola, marinara, arugula, and fig balsamic drizzle. My pizza was really good and a nice combination of flavors. Crista seemed to enjoy her pasta as well. Fortunately/unfortunately our first meal set a high bar that the second round of entrees did not quite live up to but the Tuna Coaster still had us leaving on a high note. Definitely will be going back!